Is there any city in the world that has shaped the content of popular culture more than Los Angeles? Sure, New York is more photogenic, London is cooler (in every sense), and Paris more romantic, but there’s something about the sprawling, palm-tree ambience of LA, where everywhere is 45 minutes by car away from everywhere else, that has made it the epicentre of the world’s film industry. Therefore how LA thinks is crucial to how we see the world – through the big screen at least. It simply wouldn’t be possible for the city’s music scene to be as influential and lucrative as its films, but they’ve had a good go. From the country-rock days of The Byrds, Buffalo Springfield, and The Eagles, through the ‘80s and ‘90s hard rock and hair metal phase, to today’s diverse offerings, whose alumni include Best Coast and Local Natives, there’s certainly a lot to commend LA’s music scene. There can be no doubt about the continent from which Northern American spring; we can add their name to the long list of LA hopefuls too. Not that you’d really infer their city of origin from throwing on their début collection, ‘Modern Phenomena’. The first bars of opener ‘Feel Like Whatever’, with its baggyesque drumming, washy synths and trebly, languidly optimistic vocal, could have easily been recorded in Manchester any time between, say, 1992 and 2008. This most certainly is not the L.A. of sleaze and rock ‘n’ roll excess as screamingly documented by Axl Rose and Nikki Sixx. Where Northern American are concerned, Los Angeles sounds like dusty boulevards, tumbleweed, and thousand-yard-stares over the firmament into the mountains and deserts beyond. Guitars are used as watercolour backdrops rather than aggressively riffing their way into one’s skull. As the instrumentation subtly changes throughout the set, from shimmering electric pianos to eclectic percussion, the one constant is Augusto Vega’s minimalist yet assertive bass playing. He manages to achieve the subtle trick of being solid yet melodic, creating a foundation yet pushing the music forward with admirable persistence, at times having the confidence to drop out completely for a few bars, making the impact of his reappearance all the more intense. Well done that man. ‘So Natural’ is the archetypal chilled-out ballad, complete with hazy vocal and a gently psychedelic instrumental break. The title track comes in at under 3 minutes despite its sweeping ambition: keening strings reinforce the main guitar riff, while the none-more-chilled voice can just about get it together to give a gently chiding commentary on the perils of conducting one’s life through the vector of silicon-based devices. Two minutes in there’s a big crescendo, when the band might even be breaking a sweat, but don’t worry, it’s not long before they can have a nice sit down. As you might be guessing, if there’s one criticism to be levelled at this collection is that it’s almost too relaxed: certainly there’s nothing here that’s challenging or dangerous in a conventional sense, or that might give a more balanced documentary of the dubious virtues of their home town. Nevertheless, the side they have chosen to reflect, the hanging-out-by-the-pool-with-a-piña-Colada one, is amply and ably discharged here. For those of us lucky to have the opportunity to party in such style, there’s little more of an appropriate soundtrack than ‘Modern Phenomena’. 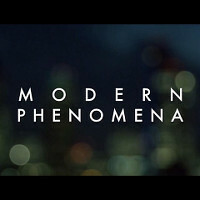 Northern American’s debut LP ‘Modern Phenomena’ is due for release on the 1st of June via Heist or Hit Records. Previous TGTF coverage of Northern American is right this way.